The image we have of Chicago in our minds is heavily shaped by its lakefront. The importance of the lakefront as public space was recognized long ago when the city built its magnificent lakefront park system, choosing to largely turn its back on industrializing the lake. Chicago was heavily industrialized, however, But the main “harbors” along which this was done were the Chicago and Calumet Rivers. The Chicago River heavily shaped the history of the city and do this day defines the boundaries of the Loop business district. Yet the city long turned its back on the river, leaving it as a working industrial, and thus polluted, waterway. 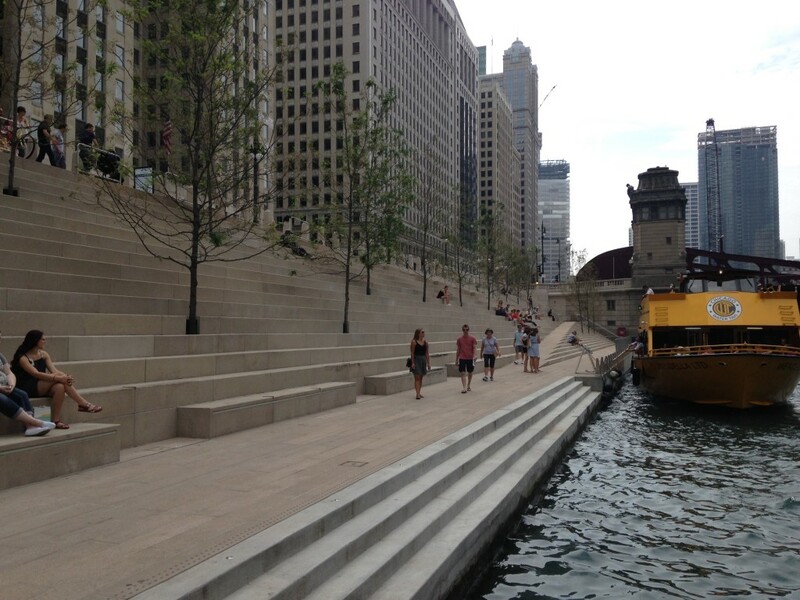 In the downtown area, double decked Wacker Dr. created physical barrier between the city and the waterfront. While these historic choices made sense for then, today the industry is basically gone from the Chicago River, pollution has been significantly cleaned up, and cities are increasingly trying to reclaim these former working waterfronts into public and recreational space. 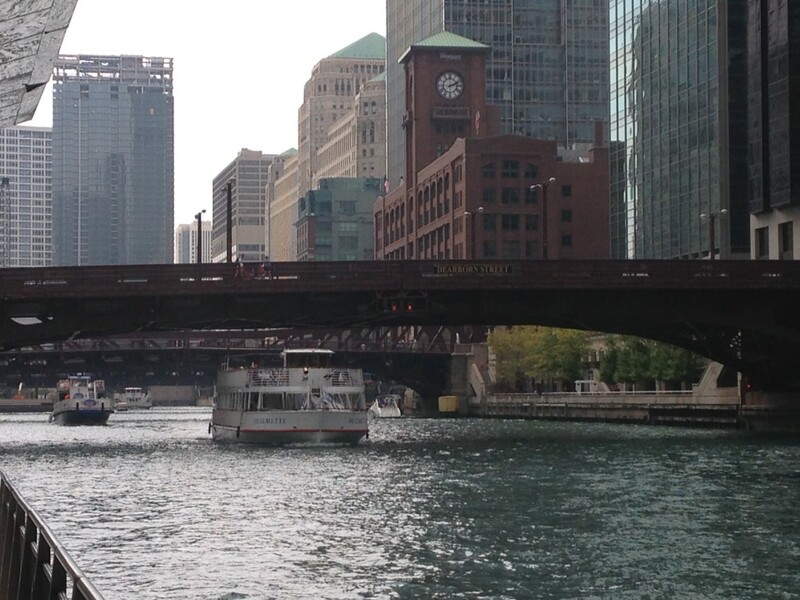 So too the Chicago River. But with a patchwork of properties directly abutting the river and highways like Wacker Dr. complicating access, this hasn’t been easy. 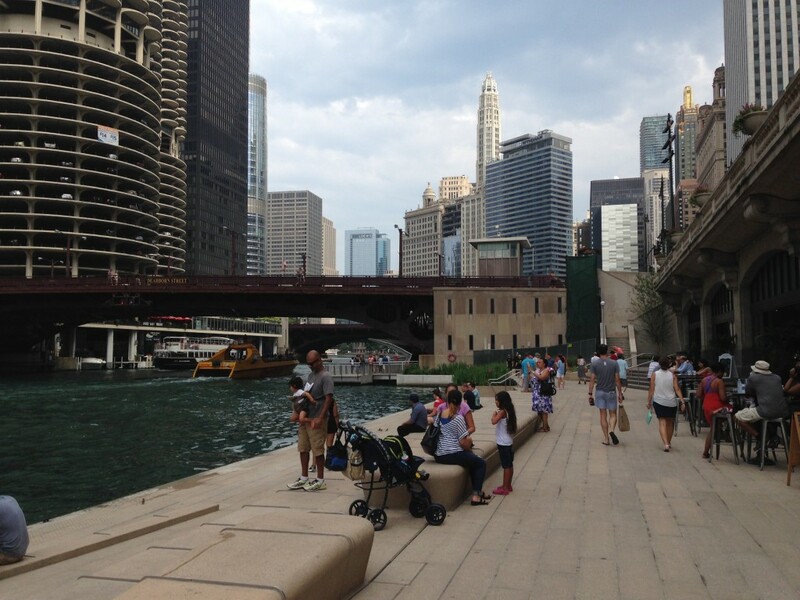 Former mayor Daley took the first steps in creating a Riverwalk, but in the core of downtown his efforts didn’t have a lot of success. 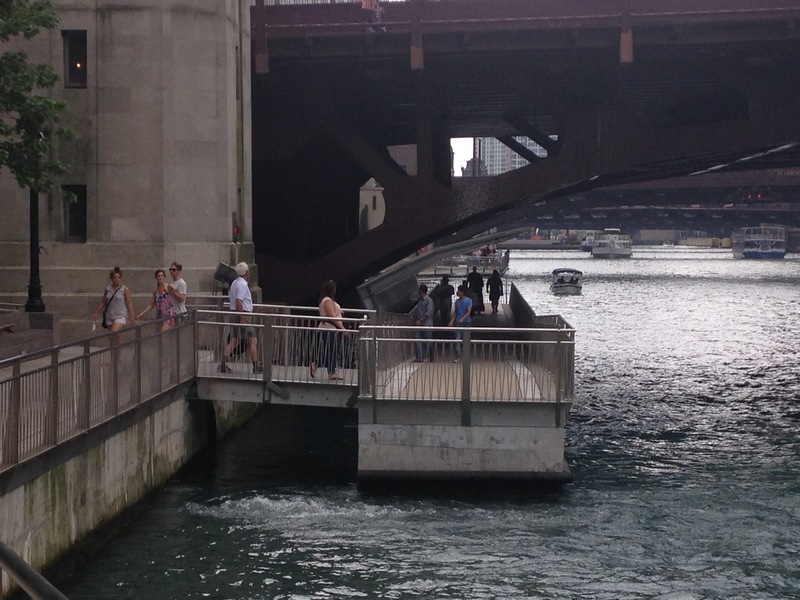 He built a series of landing between the famed drawbridges along the north edge of the Loop, but because of the bridge abutments projecting into the channel of the river, there was no walkway connecting these. You had to descend stairs to plazas that connected to nothing and had little to see or do, hence they were little patronized. 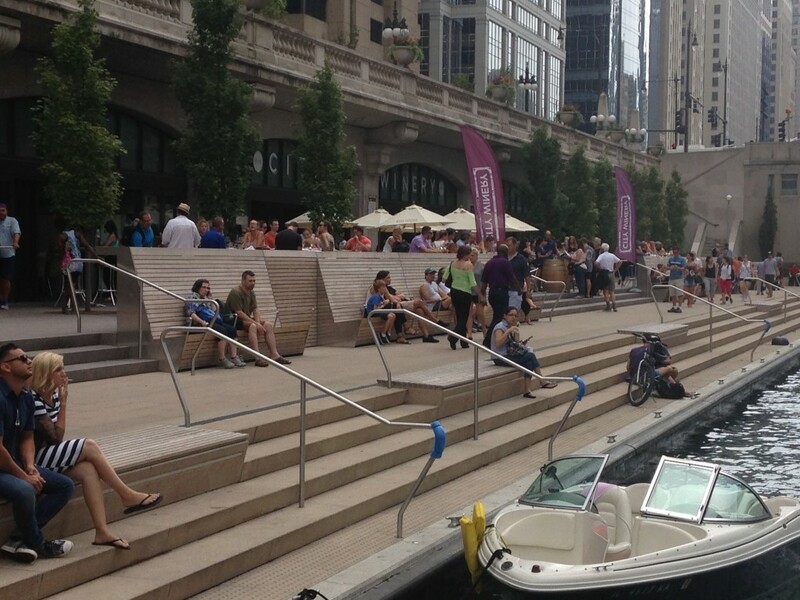 When Rahm Emanuel took office, one of his signature public space initiatives was a major push to rethink the Riverwalk and build something more befitting of Chicago. 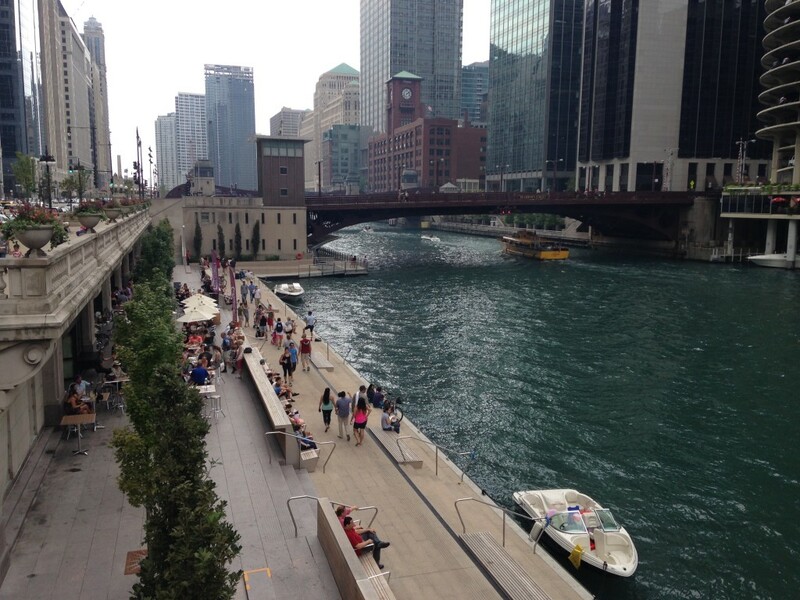 Some suggested he wanted a glittering Riverwalk to be seen as his Millennium Park. The city managed to get a $100 million federal loan to create a new and expanded Riverwalk along six blocks in the core of downtown, some of which are now open. And they are really great. As my pictures show, they are also well-patronized. Because Wacker Dr and the bridge abutments, as seen in the top picture, remain, the project team (Sasaski Associates, Ross Barney Architects, and structural engineers Alfred Benesch & Co.) and the city opted to reconfigure and narrow the waterway channel. The city got the Coast Guard to approve extending the shoreline 25 feet with landfill. And walkways were built projecting into the river around the abutments to create a continuous walkway. While many today decry landfill, it was common in the past and entirely appropriate here to overcome the geometric constraints of the existing site. Because of the bridges, the Riverwalk is still designed as a series of landings, each with its own unique design, though with a nice sense of unity as you progress. The picture above seems to be a shot many people have used to show the Riverwalk, as this landing appears the most architecturally slick. This picture also shows two key features of the revamped waterfront. The first is the way the walkway descends directly to the water level and allows you to get directly next to the water without a railing. Given our national obsessions with risk, I’m surprised they got away with that, but it’s a critical element as it really creates a sense of intimacy with the water that you would not otherwise get. To enable this intimacy, these areas are designed to flood – which they already did this year. The other is the fact that parts of the Riverwalk are actual working docks. As you can see, boats can pull up and moor, you can grab a glass of wine or burger and beer, and then motor away. This sense of being part of a still active “working” waterfront is a part of what makes this work. This experience, of being on the water in the city, is a revelation. You experience the river and the city in a way you were never able to do before. Even the lakefront, great as it is, exists in a park space apart from the city proper. This is in the midst of it. While you can definitely enjoy watching the boats from the river and such, you get a much more real sense of the water and the activity on it from the Riverwalk – all while being surrounded by a the cityscape. 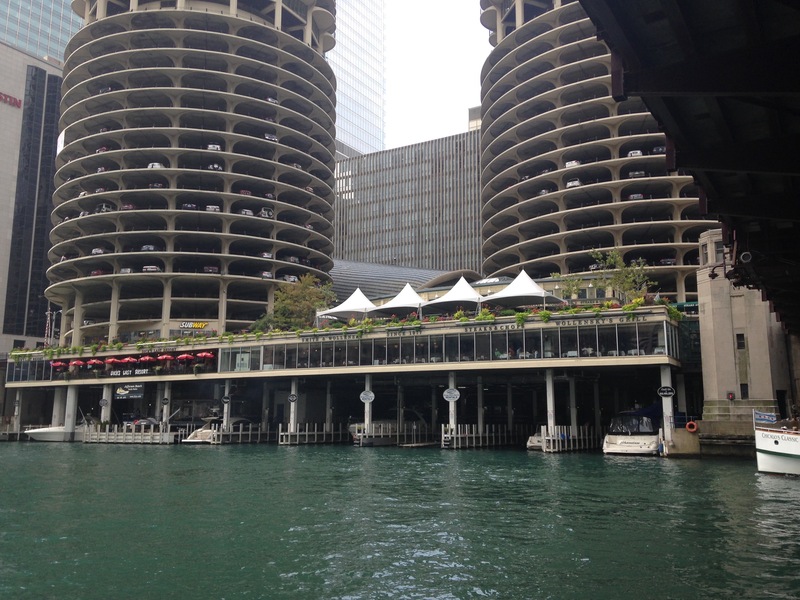 For example, it becomes obvious why they call it Marina City. The walkways between the landings are functional, but not much more. In part, this is a simple artifact of geometric constraint. The bridge and water restrict what you can do. I’m not even sure if these are permanently anchored or are designed to be removable. Still, it leaves a bit of an awkwardness to make the connection, particularly with the right angle path. A more gentle, curved connection might have produced more of a sense of a continuous path. As I said, each landing has its own feel. Here’s another one. As you see, there are fewer people here as there’s no retail along this section. I didn’t research this aspect, but I wonder if this will be used an amphitheater? You could pull a boat up next to this with a “stage.” Also would be a good venue for any type of waterborne parade, etc. This photo was taken on Labor Day, but during a workday lunch in good weather this will surely get plenty of use. Though only a few blocks are open as part of this, they connect to an earlier eastern segment from the Daley era to create a continuous path east to the lake. If you’re in Chicago with pleasant weather, this is a must visit. 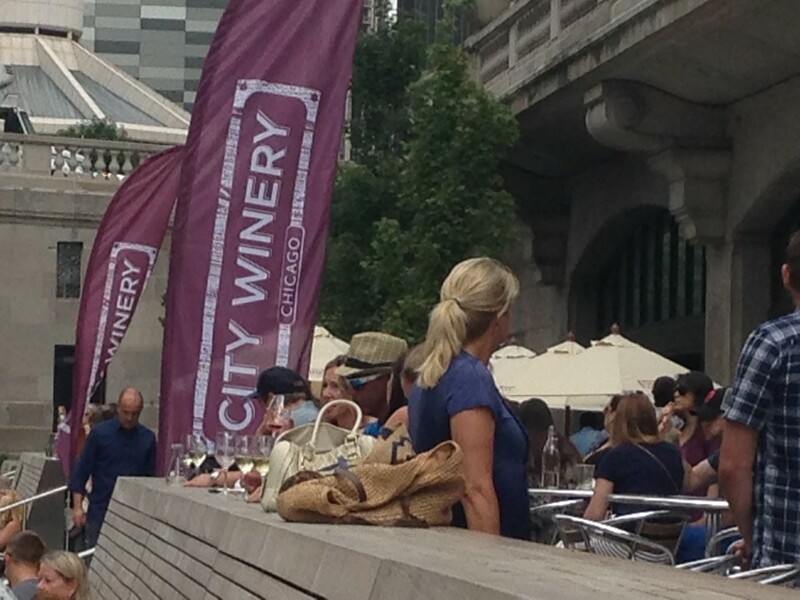 Hang out and enjoy a glass of wine while you watch the boats go by – just like these folks. Again, that’s not just because it’s good, but also because it gives such a completely different experience of the city and its integration with the water that helped give it birth. Should you want to see more, I put up a collection of more photos into a Flickr album.